Resources can be added to multiple bookable products with a global level of availability or individual availability. An assistant who can be booked to organize a wedding or a 50th birthday party, but not both at the same time. A room that can be rented for a kid’s birthday party or for a company event, but not at the same time. Go to Bookings > Resources. A list of current resources and any products they are assigned to is displayed. Select Add Resource at the top. The Add New Resource screen appears. Enter a name/reference for the resource. Make sure you name your resources appropriately and do not use the same name twice to make managing your site easier as your site grows. Add Range if the resource has any restrictions on availability. Similar to Availability on a Bookable product. More details at: Custom Availability Range. Publish to make the resource available. Once the resource has been added, you can assign the resource to products. Go to WooCommerce > Products. Select the bookable product you would like to Edit. Scroll down to Product Data and tick the Has Resources box. Go to the Resources tab. Enter a Label to be shown to customers if Resources are Customer Selected. If automatically assigned, leave blank. Select a Resource from the dropdown in the lower right. New resource: Select Add/link Resource, then you are prompted for the resource name. Once entered, a new global resource is created in the system. 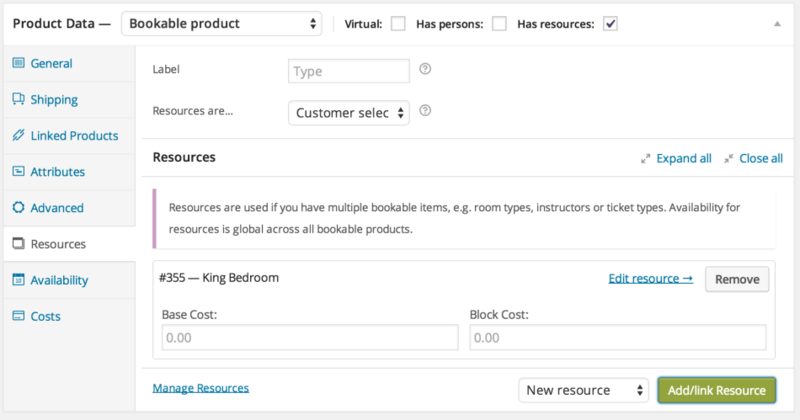 Existing resource: Select Add/link Resource, then you are prompted to enter a Base/Block cost. The Base cost is applied when the resource is chosen; the Block cost is multiplied by the number of blocks booked. 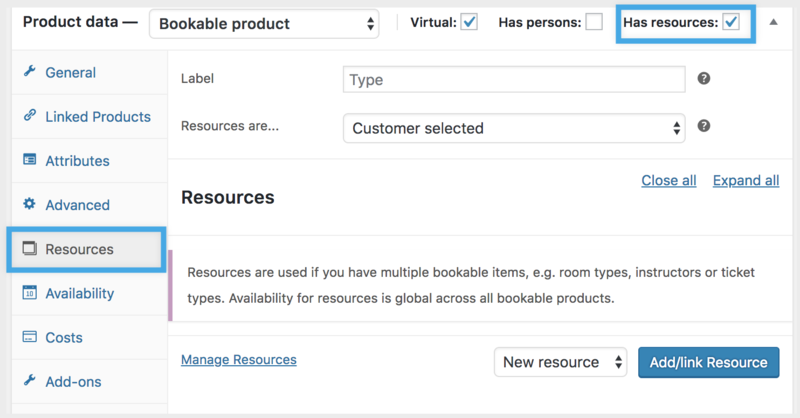 Update the Bookable Product to save resources.